According to a research report published by Transparency Market Research, global logistics market will reach US$15.5 Trillion by 2023. This indicates the high potential that this industry possesses and the opportunities that can be explored by various people and businesses in this market. If you are a marketer who is looking to expand your hold in this industry, Blue Mail Media’s Supply Chain and Logistics Industry Mailing List could be a perfect knowledge resource for you. 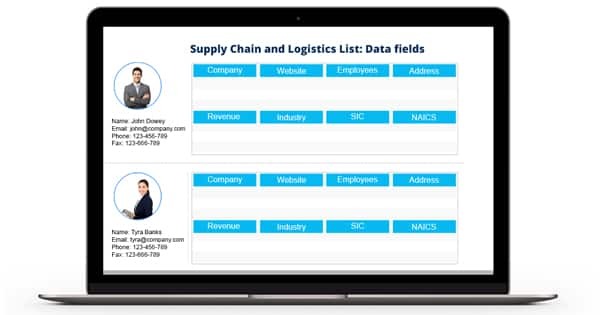 Our Supply Chain and Logistics Industry Email Database can help you reach key decision makers, solutions and services providers, logistics support providers, software providers and other professionals in a significant way. Blue Mail Media’s SCM Industry Email Database has been prepared to help marketers meet their multi-channel marketing goals and significantly ramp up their marketing operations. Our mailing list allows marketers to connect with their target audience via phone, email or mail. We do not follow a one size fits all approach in serving our clients’ data needs. We provide pre-packaged Supply Chain Industry Email List to help marketers meet their immediate marketing requirements. And marketers can also get their list customized based on the specific campaign requirements they may have. Reasoned to the same, our clients enjoy greater flexibility and experience significant rise in the response rate, conversion rate and returns on investments. The list has been prepared by our team of highly skilled data scientists and professionals who put immense efforts in collecting data from authentic sources, verifying data for accuracy and updating the same at regular intervals to ensure high data accuracy at all times. To know more, get in touch today!